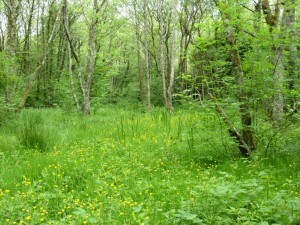 In 2008, BEC Consultants prepared a 50-year management plan for Ballyseedy Wood in County Kerry. This project aimed to facilitate a structured approach to management, taking into account the presence of the EU Habitats Directive Annex I habitat alluvial forest and the requirements of recreational and educational users. The plan set out recommendations for practical works to be carried out within the woodland over a 50-year period to enhance the internationally important native woodland, gradually remove non-native tree species with minimal impacts and improve conditions for salmonid spawning in the River Lee which runs through the woodland. The project comprised a botanical survey, tree stand survey and preparation of a stand and habitat map. Management zones were identified for the woodland, and the types of activities which can occur within the zones were specified. Management aims and objectives were also listed for each of the habitats and features identified. O’Neill, F., Perrin, P. & Barron, S. (2008) Ballyseedy Wood: A 50 Year Management Plan. A report submitted to Kerry County Council.